Astroman is one of the best long free routes in the United States. 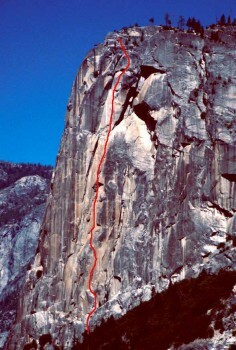 When first established this climb was the domain of only the most honed climbers in the world. Today, still considered a Valley testpiece, Astroman has lost little of its stature or mystique. Climbers who have the skill and nerve to attempt Astroman will find tremendous exposure, flawless rock quality and mostly solid protection. The climbing involves every technique imaginable from balancy face moves and boulder problems to sustained hand jamming and a squeeze chimney. Which SuperTopo guidebooks include a topo for Astroman? I was not too happy with the route name Astroman when I first heard it. Sure, the word itself had a fabulous ring to it, but the newly named route already had a name. This was what disturbed me. Never mind that the old name was pedestrian: the East Face of the Washington Column. This was back in 1975, and the arrogant notion of re-naming a route once it had been freed was fairly new. (I’m still not thrilled by this dying trend—and pleased that Lynn Hill didn’t re-name The Nose!) And yet the climb christened Astroman, so radically different from the East Face route of 1959, perhaps demanded a new name. When John Bachar, Ron Kauk, and John Long topped out on that afternoon a quarter-century ago, they knew they had done something remarkable—the most continuously difficult free climb in the world. Of the 12 pitches, two were easy, five were 5.10, and five were 5.11! The original ascent, made by Warren Harding and Chuck Pratt, had been a fixed rope effort from bottom to top—a year-long adventure. In addition, the trio had used aid on virtually every pitch—probably 225 aid placements altogether. The route overhung for much of its 1100-foot height and it leaned annoyingly to the right on many pitches, making even the aid strenuous. Pratt and I, along with Eric Beck, made the fifth ascent in 1967 and used about 150 aid placements. The idea that the route would ever go free was ludicrous. Even that great crack specialist Pratt never harbored such a thought, though he did some scary and innovative 5.10 climbing on this route. Kauk and Bachar, both 18 years old, went up on the route early in 1975 to see if a long, steep corner low on the route could be freed. Incredibly continuous, the corner (soon named the Enduro corner) did indeed go free at 11c. Kauk later called this severe pitch the “key to the door.” The remainder of the route didn’t look much worse, and when John Long heard this news he persuaded the pair to head back up with him. Astroman takes a brilliant steep and clean line. The South Face of Washington Column. The line follows a series of small features. A series of steep corners lead to an exposed face. The steepest route on the Column.